Last week saw Pentagon take on their first charity event of 2019 raising funds for their charity partner of the year, Chestnut Tree House. 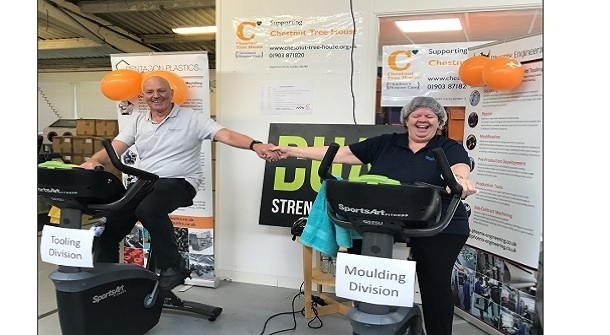 Just to add a little ‘friendly’ competition the staff were split in to two teams the Moulding Division and the Tooling Division. Competition was rife over the two-day event as the teams showed great commitment to pushing the pedals. With lots of laughs and fantastic team spirit Pentagon managed to cycle a massive 303 miles in total, with the Tooling Division just riding the furthest distance. Coupled with other business and staff donations the total raised for the event was £723.00. The work and care undertaken by Chestnut Tree House is truly breath taking, supporting children and their families as they go through a life changing journey together. Pentagon are proud to be able to support such an amazing charity and are looking forward to continuing their support.